WG is a game for many people, designed for the show "Oasis Places" at Maryland Art Place, May 2-June 22, 2013. The point of the game, really, is to mix up crowds of people at the opening, and visitors after the show. You, personally, win whenever you meet an interesting person. But that can be an effort, and WG is here to help you make up some graceful words. All you need to play is some WG cards, six per player, or a smartphone. The cards are free, and there should be a large box of them in the center of the room-- you'll need eight. Alternatively, there is an online card generator; either way is fine. 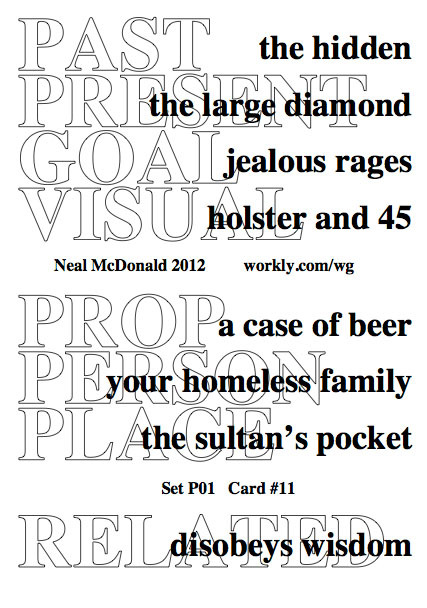 Terse rules for the game are given on the back of every card. This page gives a longer version of those rules. Since WG calls itself a "game," you might expect to be able to win, but it's a game for people in an art gallery. There is no winner, and no clear ending-- it's a French Art Film of a game. "Oasis Places" is the name of the show the game appears within, and it has a desert theme, which the game adopts: you play as a wanderer in the desert. There are thousands of different WG cards. In the course of playing the game, you will use four or five cards. You will the first card to make up a character, and the others to interact with other people's characters. Start by picking a card. It doesn't matter which one, or how you pick it. You'll create your character by imagining a biography for it, using the phrases on your card as hints. Where is this person from? What are they trying to do? Everyone thinks that they are simply a rational actor responding logically to their situation, but so much of everyone's situation is internal, or in the past, or a side-effect of their physicality. These attributes, when observed, comprise a character. The cards try to provide sparse but helpful details. Given that you are in the desert, the looming question is "why?" This card hints at a terrible, tragic past-- excellent! Your character may be a wreck, but remember that you, personally, are in a gallery: you need something to talk about. Details to work in are excess knowledge, night screaming, a lost love, and the shakes. Your beautiful family was killed! Maybe. And you just want to forget them. You're in the desert to trick it into killing you. That's its favorite trick, of course. What did you learn that brought on this tragedy? This starts your story, but you need more data: time to get out there and mingle! I assume you're wandering in a place where you're likely to meet other players. It helps to keep the cards out, so people can see that you're open to having a conversation. Once you meet another player, trade stories-- remember, your only real goal is idle talk. Once you know enough to proceed, pick a card-- one of yours, one of hers, shuffle them together and draw-- doesn't matter. Then, like fortune-tellers, read the sotry of your characters' encounter out of the card. The "Related" line gives the verb for the encounter. She's givng you advice, and apparently, you're blowing it off. There's a case of beer in play, so you're at least able to go to a bar. You could choose to look into the matter of the large diamond. You could explain how one of you came to be so well- and visibly- armed. given your past, it's not hard to understand. Your family is dead, so it's not homeless.. hmm. Well, if she's giving you advice, then maybe she's not wandering so much. Or maybe she came into the bar and acted like a nut to get a beer. Maybe you knew each other before-- a hidden realtionship? You've got a 45 and a bad secret; what happened to your family is starting to look fishy. The story you started with might not be the one you end up with, and there's no one to say how it should go but you. That's the game. To win, meet a stranger and say something interesting. Many of the goals do not make sense, or do not make sense in your context. The desert is large; your logic gets you only so far. Not applicable; this is not a play-- it's improv. Sense of place and surprise is more important than resolution. Even more important? Keeping the chatter going. The Cardinal Rule of Improv is "Yes, and! ": when someone offers up a stupid detail, it's much harder to keep going if you correct it, or try to improve it. They get embarrassed, everyone has to remember what's in and what's out, ech! Don't say "no," just say "yes, and," and move on. It keeps the scene going, helps your partner feel confident, and is nicer. Your goals determine your actions-- but the other player can't see your goals; they only see what you tell them. The more complex your invisible goals, the more interesting your actions will be. You don't have to use all the modifiers, but I think the best players would. 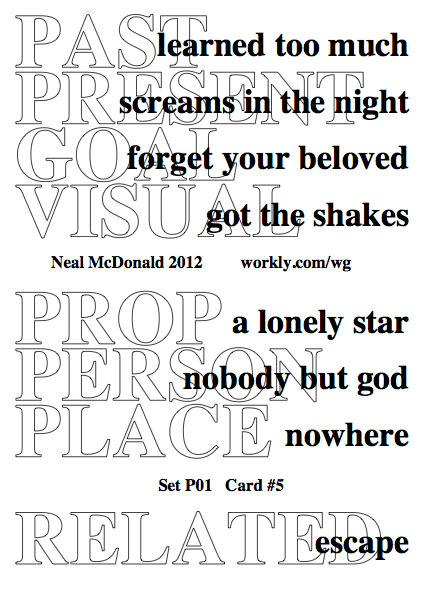 There are three means for getting cards: find some lying around, print some out, or use the card generator. The card generator is a web page. When you load it, it either uses the time of day to give you a random card, or you can give it a ID number and get a specific card. Printing cards is both easy and hard. It's easy, because everyone has a printer. It's hard, because every GGF card is unique, and printers like to print on certain sizes of paper, and, generally, they don't cut things. By printing this file, double-sided, you can make 50 sheets of 8 cards. Email me if you want a bigger set. 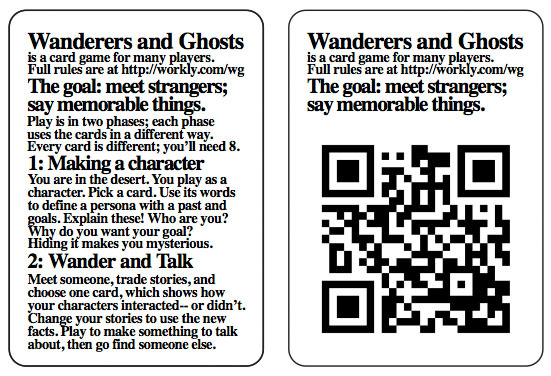 Wanderers and Ghosts is my game. Anyone can play it for free, and anyone can print all the cards they like. Deriviative works are fine with me. Have fun!